Losing important data saved on PC Windows 10 without any quality data recovery software installed on it can become a nightmare. Whats most dread is the scenario of working on an important document or performing a task on computer but all of a sudden due to some unforeseen circumstance such as virus attack, accidental file deletion or hardware malfunction that document, file or data item gets deleted, especially if its not been backed-up previously. This is where it is recommended to download data recovery app on PC to recover lost files immediately. Best data recovery apps can even restore files that get deleted permanently. With top 3 data recovery apps listed in this post you can recover file of any format including text, image, video, audio and many more. Windows 10 apps and files can be recovered easily with the data recovery programs that we will discuss in this post, you can also download the free version of them here. Following are the best data recovery apps that can be found on the internet because of their comprehensive data recovery service. Reinstalling windows has removed important files? pictures from camera got accidentally formatted? shift+delete resulted in permanent file deletion or bungled disk partition impaired normal file functioning? 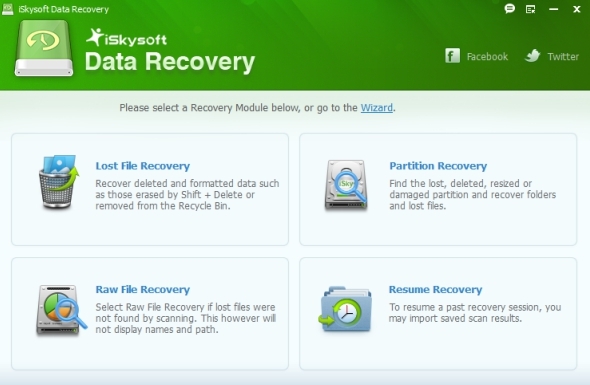 well, now, there is a cure for all these situations in the form of iSkysoft Data Recovery app. Specifically designed to redeem lost files on Windows PC, with this app you can easily and securely retrieve lost data from memory cards, computer hard disks, USB, external disk or any other storage device. You can also salvage data lost due to emptying Recycle Bin without backup. iSkysoft Data Recovery is compatible with Windows 10/8/8.1/7/Vista/XP and data on FAT32, FAT16, NTFS and exFAT file systems. It restores images (PNG, JPG, GIF, TIF etc), videos (AVI, MOV, MP4, MKV, WMV etc), audio (MP3, AIF, WAV, WMA etc), document (PDF, DOC, DOCX, XLS, PPT, HTML etc), archives (ZIP, RAR, SIT etc0, emails, mp3/mp4 audio files, USB as well as data on hard drives, digital cameras and memory card. In three simple steps recover permanently deleted data; select recovery mode, choose scan device option and files are recovered. There are four recovery modes in the software Wizard Recovery Mode, Lost file Recovery, Raw File Recovery and Partition recovery, click here to see how this app works. It also comes in paid version including lot more features for both home and business users. Pandora Recovery app recovers files on FAT32 and NTFs file system. What happens is that when a file gets deleted it’s not completely removed from the disk, only file reference in File Allocation Table (FAT) or Master File Table is noted as deleted, which means deleted files can be recovered with data recovery software. With Pandora Recovery files such as images, videos, audio, documents, presentations saved on FAT32/NTFS system can be quickly retrieved. It scan the hard drive for deleted files and builds an index of all files, both existing and deleted, on computer’s drive with supported file format. After scanning you can choose which file to recover and which one to discard, also select the destination folder for recently restored files. If you remember full or half file name, file size, creation date or last accessed date then enter it in software search to quickly find the deleted file in the hierarchical structure. Moreover, you can preview files before recovery them to decide if they are worth the time and hassle. All popular audio, video, document file formats are supported. 1 – Download Pandora Recovery Free here. 2 – Open the installer file downloaded above. 3 – Click Run button on pop-up installer window. 4 – Follow on-screen instructions for installation. 5 – After installing the app, use wizard option on the home screen to start data recovery. It is recommended that you select an external storage device like external hard disk, USB, network drive, DVD or other external media for restoring deleted files because restoring permanently deleted files on the previously installed location could result in partial loss of the content. If a file is lost due to hardware crash or accidental deletion and you forgot to create its back up then worry not because with Recuva Free Data Recovery tool you can recover such files on Windows PC, Digital Camera and MP3 Player. Videos, music, documents, photos, and many other file formats are supported by Recuva. It even fetches data from memory cards, external hard drives and USB stick. Also retrieve data from formatted drives. It also permanently deletes files that you want gone for good, so that they don’t fall in someone else’s hands with data recovery program. Recover files from floppy, memory stick, jaz disks, digital cameras, media cards, digital cards etc. For paid version that comes with extended service and backup CD click here. It also updates to the latest version so that you won’t have to manually upgrade every time a new version comes along. You can also recover images with paid version, a features not available in free offering. Also See: ComboFix for Windows 10 & How to Disable Windows Defender permanently in Windows 10.